In late pregnancy, almost all women have 100% occlusion (blockage) of the Inferior Vena Cava (vein) when sleeping on the back. Hidden danger: only 13% of women go to bed supine, but over 50% end up spending at least 1.5 hours supine each night and over 80% spend some time supine. 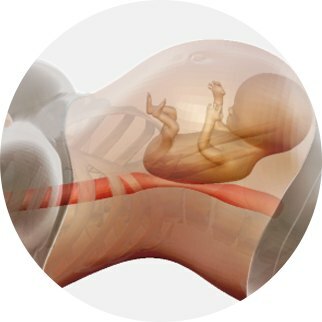 Women with pronounced snoring and sleep apnea during pregnancy are twice as likely to develop preeclampsia. 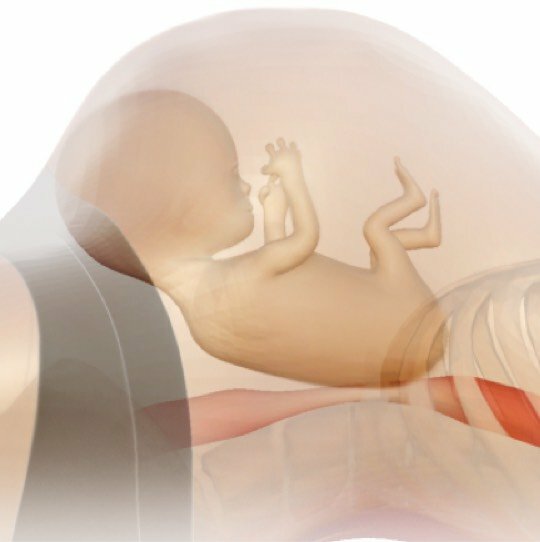 Preeclampsia (a complication observed in 7-9% of pregnant women that causes high blood pressure, kidney damage, and other problems) is the leading known cause of pre-term birth and is also associated with 2x risk of autism. Supine sleep results in a 2.7x increase in the frequency and severity of snoring and sleep apnea, both of which are highly associated with preeclampsia and gestational diabetes. Woman in Left Sided, OB recommended, sleep position. Our smart wearable sensor vibrates when you have been in a dangerous position for too long. Easy-to-use app lets you see your sleep patterns and adjust alarm settings. Woman in Left Sided, OB recommended, sleep position. Easy-to-use app lets you see your sleep patterns and adjust alarm settings. Sign-up for Pregnancy Coach health tips to help you avoid harmful sleep. Learn more about clinical studies on the benefits of avoiding back sleep during pregnancy. Thank you for subscribing to our newsletter. May we have your name? US Patent Nos: 9,585,614, 9,763,616 and 9,918,673 and Patents Pending. The Pregnancy Coach System does not fit the definition of a regulated medical device at this time and therefore it is not subject to oversight by the U.S. Food and Drug Administration (FDA). The Pregnancy Coach System is currently marketed as a general wellness product only. Neither the statements on this web site nor this device have been evaluated by the U.S. Food and Drug Administration. This product is not intended to diagnose, treat, cure, or prevent any disease, injury or condition. The information on this site is not intended or implied to be a substitute for professional medical advice, diagnosis or treatment. All content, including text, graphics, images, and information, contained on or available through this website is for general information purposes only, to help with education and create better conversations between patients and their healthcare providers.